Anwar Robinson’s Voice Is Stronger Than Ever. Since His American Idol Days, Anwar’s Been Making Magic In The Studios Of Bo-Ty Productions Grabbing The Attention Of Music Greats. What do legendary songwriter, Carole Bayer Sager, Saxophonist/Grammy Nominee, Gerald Albright, Singer Songwriter/Producer, Will Downing, and pianist, composer and arranger; Onaje Allan Gumbs have in common? 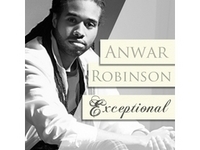 All love Anwar Robinson’s newest release called “Exceptional.” The buzz on this track is getting louder and for good reason. It doesn’t matter where you start to break down this song, you’ll love every last drop. The lyrics are intimate and personal without sounding contrived. Each word flows into the next while Anwar drives raw emotion into every phrase. This is a beautifully crafted song and Anwar’s passion for singing is evident. Had he performed “Exceptional” on the Idol show…who knows? The good reviews don’t stop. Gerald Albright has firsthand experience working with Anwar from the Idol days. Hearing “Exceptional” Albright said, "I truly love the song "Exceptional." After performing with Anwar Robinson on American Idol, I immediately became a true fan of his voice and delivery. I also enjoy the wonderful textured and intimate production of this great song. It's a pleasure to hear real depth and passionate lyrics in the songwriting efforts. In this midst of so much that is shallow on the playlists of today's radio programming, this song is a welcomed relief." Anwar Robinson commented, “Working in the studio speaks to the creative process. "To this very day, I am still amazed with the results of collaborating with Tyrone and Bob. We have had a long-standing working relationship and even friendship, which is a rare treasure in the business that we are in. Bob and Tyrone have always supported me-long before I garnered the fan base from my run on "American Idol: Season 4,” and that speaks volumes. Robert Donzella, Co-Principal at Bo-Ty Productions sums it up . . . “One day, while visiting a fellow producer's studio in the corner of the room with his back towards me, a young man was playing incredible piano . . . A few minutes later I met Anwar. Move forward in time and I find myself in a writing session with Ty and Anwar on Night's Hot . . . It's comforting to know when you have a kernel of an idea your partner can take it and whip it into something cool...something Ty does frequently. As a production team both of us are very open to the artist's input. Needless to say Anwar's contribution was spot on and vibey. Add up the elements of unique track, interesting melodies, personalized lyrics and Ty's EXCEPTIONAL vocal production, put them in a creative box, squeeze in some inspirational glue, shake it around and you've got a Bo-Ty production.